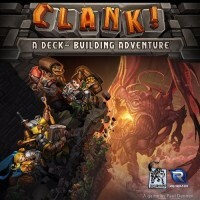 BoardGaming.com> Games> Board Games> Clank! Burgle your way to adventure in Clank!, the new deck-building board game. Be quick and be quiet. One false-step and -- CLANK! Each careless sound draws the attention of the dragon, and each artifact stolen increases its rage. You can only enjoy your plunder if you make it out of the depths alive! Since Dominion there have been a dearth of deckbuilders. Many have missed what makes Dominion so good – the speed. In Dominion players can play their hand very quickly, draw up a new hand and cycle through their deck very fast. Many of the more modern deckbuilders have switched gears and taken more of a hand management where the players don’t want to lose cards from their hands and where getting through your deck is a bad thing. Pleasingly, Clank! eschews all of this modern deckbuilding nonsense and goes back to the Dominion feel. Players start with a small deck with some ok and some rubbish cards in. They will buy cards from a row that’s on offer and increase their powers. Those powers will become important in doing a bit of dungeon delving. The players in Clank! have dared each other to steal the best treaure from the dragon’s dungeon. To win, a player must get into the dungeon, find an artefact and return to the start with it. However, they must also prove themselves to be the best thief so must get as much gold as possible as well. Cards and tokens will also be worth points at the end so gather as many of those as well. Once one player gets out then it’s a race for the other players as the dragon (who has now been told about the other players and their evil thievery) has awoken and will attack every turn! Oh, I forgot to mention the dragon attacks! Players should try to be stealthy in Clank! as stumbling around, stealing valuable gems or flipping lucky coins(!) all produce Clank!, i.e. noise. The more noise you make the more likely the dragon will hurt you when it attacks. And dragon attacks are always a surprise (until one person gets out). It’s a great game with a great sense of humour. The game hits all the fantasy tropes but adds fun to them. Singing sword? Great for fighting monsters but all that noise it’s making is bound to attract the dragon! That pesky Kobold? He’s weak but until someone takes care of him he’s going to keep pointing out your whereabouts to the dragon. And the endless goblins that provide players with an endless supply of coins. In Clank! you are trying to steal the best loot from a dungeon and escape with it to win the game, but so are your fellow thieves. You can explore various areas of the board, picking up valuables along the way, but you need to think about making it back out again. As you steal things, you Clank! and make noise that catches the attention of the dragon, who might do some damage to you. Enough damage and you might not make it out with your loot. Some board spaces will have two minor secrets, one major secret, or an artifact. Place the items to purchase in the Market. Place the Monkey idol tokens face up in the monkey shrine. The secrets are face down and hidden, but the Artifacts, market items, and monkey idol tokens are face up. Place the Mastery tokens near the board. Place the dragon token on the rage track in the space matching the number of players. In the deck of cards, find all the Mercenary, Explore, Secret Tome, and Goblin cards. Make one pile for each type of card, and place face up near the board. Set aside all the cards in the deck with a gray banner. Shuffle the remaining cards into the dungeon deck and place face down. Deal 6 cards face up in a row. If any show the dragon symbol, replace them with another card from the dungeon deck, and then reshuffle the deck. If any cards have ARRIVE text, resolve it now. The cards with the gray banners make up the players starting decks. Each player starts with 6 Burgle, 2 Stumble, 1 Sidestep, and 1 Scramble card. Players shuffle their own decks and place face down. Take 30 Clank tokens matching the color of your Token. Place the tokens at the entrance. Choose the sneakiest player to go first or choose randomly. The 1st player puts three Clank! tokens on the board on the Clank! banner, player two places two, player three places one, and player four would place none. Players draw 5 cards each round from their individual deck. Cards with a blue diamond have a number which are skill points. You can use your skill points to purchase cards from the dungeon row and reserve decks. The cost to purchase in the lower right corner in a triangle. Skill points do not have to be spent. Once purchased the cards go face up into your discard pile. However, if the card has an ACQUIRE box, that happens immediately and only once. If your deck ever has less than five cards, draw until your draw pile is empty, then shuffle the discard pile, and continue to draw. Some cards in the Dungeon Deck and Reserve Deck are monsters and these cards have swords displayed in the lower right corner. This is the cost to defeat them, so if two swords are displayed on the card, you need two swords to defeat them. Once you defeat the monster, the card will tell you what you have gained. If there is a device in the Dungeon Deck, when you purchase it, the use is shown on the card and you take that immediately. Replace cards in the Dungeon Deck at the end of your turn. Some cards have a boot symbol which allows you to move on the board. Swords and skill points can be divided however you want, they do not need to be spent on a single card. As you move through the board, you will collect loot. Secrets will either be something you can use during the game (extra health, or extra movement) or be worth victory points. If you pick up an artifact, you can only hold one, (unless you bought a backpack at the market). The market also sells keys that allow you to move through locks, and crowns which are worth victory points. Some cards will show that you have awoken the dragon. Place all the Clank cubes into the dragon bag and pull the correct number of cubes from the bag. Cubes are added to the bag based on cards played. The rage track will tell you how many cubes to draw and some cards can effect that number. Black tokens have no effect and are removed from the bag when drawn. Colored cubes are placed on that players health track. If the health track becomes full the player is considered knocked out and the consequences vary. If you are knocked out and above the grassline (in the castle) and you have an artifact, you will be rescued. You can count your points at the end of the game, but you can no longer take any actions, and the dragon will not effect you. If you are knocked out below the grassline, in the dungeon, or you have no artifact, you will not be rescued and do not score at the end of the game. Once you have an artifact you can head to the exit and when you exit, you take a mastery token. Once a player leaves the dungeon, whether they were knocked out or not, they go onto the track near the exit, which triggers the dragon to attack. In addition to the cubes indicated on the rage track, you draw additional cubes according to the plus symbols on that track. If you reach the last space on that track, any players that have not exited are knocked out by the dragon. We played with three people and the game moved at a good pace. Each turn offered at least a couple options of where to go, what to explore, or what to buy or fight. During our first game there was some lag as players decided what to do, but you can look at the cards in your hand while others take their turns and start to get your plan ready, so I think it will play faster as you get more familiar with it. For all the actions and variety going on in this game, I did not think it had a sharp learning curve. I felt that the mechanics were fairly easy to grasp. There isn’t much interaction between the players. Each player decides where they want to go on the board and what they want to do, there is no fighting between players or trading, or buying. You do need to keep an eye on what other players are doing, because you choose how deep in the dungeon you go, and you don’t want to be caught with the dragon when everyone else has left. For me, I still felt there was enough player discussion so I did not feel I was playing a solitaire game with other people, if you know what I mean. This is another game where I had no real sense of who was winning. Also, although I felt there was variety, I could see this game getting stale after playing it a lot. The cards I was able to afford to buy didn’t really add a lot of unique actions to my deck, so I was moving, picking up loot and fighting some monsters when they showed up. This is a fun game that I would play again, but probably not every week. Clank! has all necessary components of a classic deck-building game. A starting deck of weak cards to purchase bigger and better cards, the ability to fight monsters in the lineup with attack cards, the option to purchase cards that offer victory points at the end of the game but do absolutely nothing but clog your deck until then. Everything you learned from Dominion and Ascension is present and recognizable. But then there’s a board with spaces and more monsters and treasures and, oh yeah, don’t wake the dragon! The dragon’s anger increases every time a major treasure or dragon egg is picked up, and it attacks with the arrival of certain monsters on the line. The more noise you made along the way (measured in Clank!) the better chance you’ll catch some of that dragon fire! It’s a deck-building, bag-building, push your luck, adventure race between thieves. Make it all the way out and you get extra points and the chance to poke the dragon to kill anyone still in the dungeon! It’s easy to teach and full of strategic options. Randomized loot plus a double-sided board keep the game fresh and interesting. It’s a great game for families and beginners to the hobby, with plenty to offer avid gamers. The cards seemed prone to scratching up quickly so I sleeved mine. All the other components are great quality with a box insert that fits everything perfectly, even with sleeves. A must try. May the best thief win! Add a Review for "Clank!"